Being involved in a dog bite attack is a traumatic experience, in some ways not unlike being involved in a car accident, a house fire or some other event that takes its toll physically, emotionally and financially. Despite this reality, it is important for a person who has been injured in a dog bite attack to take certain steps in order to protect his or her legal rights. The California dog bite lawyers at the Dog Bite Law Group have been helping victims of these attacks for several years. We fully understand the chaotic nature of the immediate aftermath of an attack. Therefore, we’d like to provide people with some clear steps to take so that if they are Injured in a dog bite attack, they know what to do next. Below you’ll find those steps, and if you or someone you love has been harmed in this manner, contact our firm immediately to schedule a free consultation. Obtain immediate medical attention – This may involve going to the emergency room or even calling for an ambulance depending on the situation. Get the names of those involved, including witnesses – You will need to know who owns the dog so that you can take appropriate action after you receive treatment. Also, be sure to get the contact information of anyone that may have witnessed the attack. Take photographs – If at all possible, take photographs of your wounds before they are treated, as these could prove to be important evidence. File the report – Depending on where you live, you should file the report of the dog bite attack to your local animal control division or to your police department. Obtain the insurance information – If you are able to speak to the owner, make sure you record the insurance information if there is a policy, as any recovery will most likely work through that coverage. Contact a California dog bite lawyer as soon as possible to discuss your situation. The earlier you take this step, the more likely it becomes that relevant evidence will be gathered and preserved and the stronger your position becomes from the perspective of the other side. Follow your doctor’s advice – Make sure that you do exactly as you’re told by your doctor, and document your healing process from your own perspective. Ask for documentation – If you retain a California dog bite attorney, this step may not be necessary, but you should ask for records of your treatments, diagnoses, and prognoses. Keep all correspondence – If the dog’s owner has insurance coverage, it’s likely that the insurance company will begin sending you letters. Keep all of those letters in a file. Debating the incident – Do not engage in a debate with the dog’s owner regarding what happened that led to your injuries. Your statements could be used against you. Providing statements – Do not provide statements to the insurance company before obtaining legal advice. Insurance companies are expert at minimizing financial liability. Signing documentation – If anyone asks you to sign any documentation, do not do so until a California dog bite lawyer reviews it. Accept payment – Do not accept any form of payment, as that could constitute a waiver of any future claims and leave you shorthanded in terms of your recovery. Guess at next steps – This is not the time to “trust your gut” – make sure you get sound professional advice before you take any steps. If you have been wrongfully injured in a dog bite attack, you have been forced into a very difficult situation. You have a lot to handle in a relatively short amount of time, and you face a difficult struggle medically, emotionally and financially. Instead of attempting to take all of this on by yourself, you need to make sure that you have every advantage working for you as soon as you are hurt. 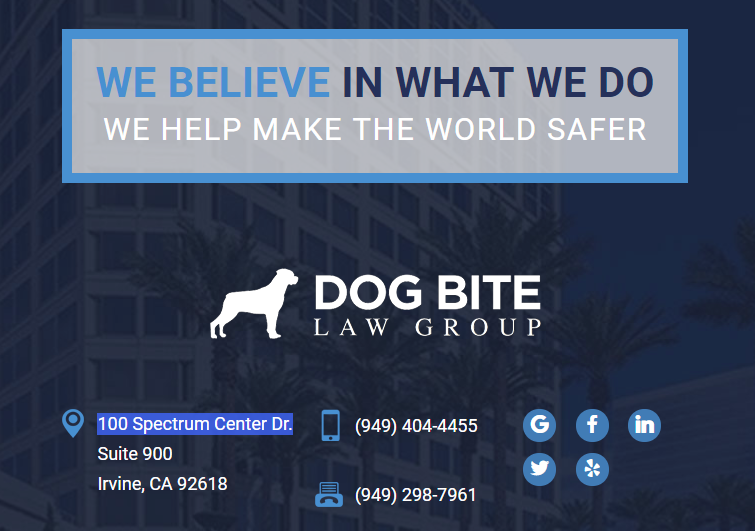 You can do so by seeking the help of an Orange County Dog Bite Lawyer who has helped clients obtain proper recoveries for their injuries. Contact the Dog Bite Law Group as soon as possible to schedule a free initial consultation.